As the oldest permanent settlement in the Louisiana Purchase, Natchitoches has been the home of diverse ethnic groups since its incorporation in 1714. French colonists settled in the city as early as 1699 and constructed a fort to stockpile goods as they continued to explore westward. In the following decades, Natchitoches’ optimal location along the Red River and proximity to the Natchez Trace facilitated its growth as a regional trading outpost. Frenchmen came to the city from throughout the area to trade with the local tribe of Natchitoches Indians as well as with Spaniards settled in colonial Mexico. After the Louisiana Purchase, many Americans migrated westward and settled in Natchitoches, building plantations and working the parish’s rich and fertile land. Upon their arrival in this booming agricultural economy in the mid-19th century, Jews found themselves immersed in a thriving community and seized many lucrative opportunities. Soon after Hyams’ altruistic act, a number of fellow Jews who had left Europe for a better life began to make their homes in Natchitoches. Leopold Caspari and his family departed from France less than one year after the 1848 Revolution, which exorcised the Bourbon monarchy and ushered in an age of political instability. Caspari arrived in Natchitoches and opened a dry goods store in nearby Cloutierville, where he continued until 1858, at which time he relocated to downtown Natchitoches. Caspari joined the Confederacy’s Pelican Rangers during the Civil War, earning the rank of captain by the end of the fighting. After the war, “Captain Caspari” rapidly emerged as one of the most popular and accomplished men in Natchitoches. He became president and general manager of the Natchitoches Railroad Company, which constructed railroad lines from Natchitoches to other major cities in Louisiana. In 1884, Caspari sold off his interests in his store and was elected to the Louisiana State House of Representatives, where he campaigned to have the State Normal School, now Northwestern State University, built in Natchitoches. Caspari Hall and Caspari Street, both of which lie on the University’s campus, are dedicated to his honorable service to the citizens of Louisiana. Most Jews who arrived in Natchitoches initially made their living as peddlers. These traveling salesmen purchased their merchandise from wholesale houses in either New Orleans or St. Louis and traveled the parish selling their stocks. As many peddlers prospered and gained recognition, they opened stores in Natchitoches or one of the nearby towns along the Red River. Samuel Aaron, a French immigrant, worked as a peddler along State Route 6 from San Augustine, Texas to Natchitoches. By 1870, he established a small general store in Grand Ecore, two miles north of the city. As railroads emerged as a major trade conduit, Aaron moved to nearby Robeline and opened a store adjacent to the railroad depot. Simon Hart arrived in the Natchitoches area from Germany in 1853 and after having peddled for several years, opened a small dry goods store. Like Aaron, Hart moved his store closer to the railroad depot serving the Texas and Pacific, Louisiana, and Natchitoches Railroads. Brothers Samuel and Howard Raphael came to Natchitoches in the early 1850s from Prussia and both opened dry goods stores in the area. Samuel’s store burned down several years later when a customer accidentally dropped a match into an open barrel of gunpowder, killing Samuel and the customer. Howard, who changed the spelling of his last name to Raphiel in order to avoid confusion with his brother, multiplied the investment in his store from $900 in the 1850s to $25,000 in 1881, at which time his son Isidore took over the store’s operation. Many Jews in Natchitoches got involved in a wide array of specialized business ventures. Albert Bernstein, a local hairdresser, advertised himself in the Natchitoches Chronicle in 1861 as one who “solicits the patronage of the public and guarantees entire satisfaction to all who honor him.” Brothers Harris and Hyman Jaffa, who arrived in Louisiana from Russia in the 1880s, opened the First Chance-Last Chance Saloon in 1895 to a favorable and thirsty reception. While successful, the saloon closed in 1908 when Natchitoches passed a law banning the purchase or consumption of alcohol within city limits. Jacob Israel came to Natchitoches from France in 1858 and operated a grocery store and hotel serving sawmill workers in nearby Provencal. In 1872, Israel died suddenly after having reportedly won a $600 poker hand. Simon Winbarg, a German immigrant who started his American life as a peddler in Texas, opened a general merchandise store with a complete assortment of furniture and clothing. Within three years, however, his store focused on providing Natchitoches residents with “fancy and staple family groceries at the lowest prices.” Winbarg’s Grocery remained one of the most successful grocery stores in the parish for over 80 years. Although Jews had resided in Natchitoches since the 1830s, it was several decades before they founded Jewish institutions. On March 30, 1871, 16 members of the Jewish community gathered at the local Masonic lodge and incorporated the “B’nai Israel Sons of Israel Synagogue,” better known as Congregation B’nai Israel. “The object of this association,” these founding fathers resolved, “is to subscribe funds to be employed in the erection of a synagogue and to keep the burial ground in good order.” For the next 34 years, congregants prayed together at the local Masonic lodge under the guidance of a series of lay leaders. Soon after the establishment of the congregation, Leopold Levy founded the Othniel chapter of B’nai B’rith in Natchitoches. Little is known about the group and its activities, yet by 1877, membership had peaked at 33 members. In 1904, B’nai Israel purchased a building on Second Street from one of the local Baptist congregations. They dedicated the temple in September of that same year; the ceremony featured speeches and benedictions by Nathan Gordon, lay leader of the temple, Phanor Breazeale, a member of the House of Representatives representing Louisiana’s 4th Congressional District, B.C. Caldwell of Northwestern State College, and Reverend J. L. Wise of the local Baptist Church. Having settled down in their newly acquired temple, congregants of B’nai Israel immediately organized a religious school with 25 students and four teachers. By 1907, the temple, under the leadership of Leopold Levy, had affiliated with the Union of American Hebrew Congregations and had reached its peak membership of 25 families. Unfortunately, B’nai Israel experienced a significant loss in participation and membership through the 1910s and 1920s. Three factors may explain this sudden decline. First, Jews in Natchitoches played an important role in the larger community and thus gradually assimilated into Gentile society. Second, the lack of formal religious leadership made it difficult to foster a sense of religious belonging. B’nai Israel never obtained the services of a rabbi, except on the High Holidays when the community hosted a rabbinical student from Hebrew Union College. Third, and perhaps most importantly, the overall Jewish community of Natchitoches declined as Jews increasingly sought opportunity elsewhere. In 1878, about 100 Jews lived in town. By 1937, there were only 45. For all of these reasons, the temple had become defunct by 1925. Trade along the Red River had decreased into the 20th century, and by the 1960s, Jewish businesses experienced fierce competition from bigger establishments in the rapidly developing cities of Alexandria and Shreveport. Some businesses, however, continued to thrive. The Lieber family’s clothing store thrived for several decades, though it has closed in recent years. Winbarg’s Grocery closed around the same time. One store has stood the test of time. Harris Kaffie and his brother Adolph came to Natchitoches from Germany in the 1860s and opened H. Kaffie and Brother General Store. 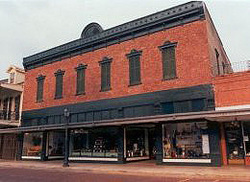 Adolph also operated the A. Kaffie City Billiard Saloon, “the resort for the elite of the city where the best and purest wines and liquors can be obtained.” While the saloon closed years ago, the general store continues to exist as Kaffie-Fredericks, a hardware and appliance store. Not only is this store the last business of the approximately 35 started by Natchitoches’ Jewish immigrants, but also the longest continuously run business in the city. Over the end of the 20th century and beginning of the 21st, the Jewish community of Natchitoches declined even further. By 1967, only eight members remained of the original Jewish families to settle in Natchitoches. Today, 18,000 Louisianans call Natchitoches home, along with the over 10,000 students who attend Northwestern State University and the Louisiana School of Math, Science and the Arts. Yet fewer than ten Jewish families still live in Natchitoches. The remaining Jewish members of the town often travel over 60 miles to Alexandria or Shreveport, both of which have thriving Jewish communities and congregations, to attend religious services. They also maintain the local Jewish cemetery, bestowed upon the community by Samuel Hyams over a century and a half earlier. A trust fund set up in 1967 has ensured the upkeep of this verdant and scenic cemetery, an homage to the town’s illustrious Jewish heritage.